Steve Millidge, CEO at Payara, recently outlined the Payara Platform 5 roadmap describing the goals for Payara in 2019. During a recent webinar, Millidge and Arjan Tijms, technical lead at Payara, further explored the 2019 roadmap. A brief review of 2018 accomplishments was highlighted by the introduction of Payara Platform 5 with the release of Payara 5.181 in March 2018. This year, Payara is once-again planning to deliver quarterly releases (5.191 through 5.194) of Payara Server 5 and Payara Micro 5. 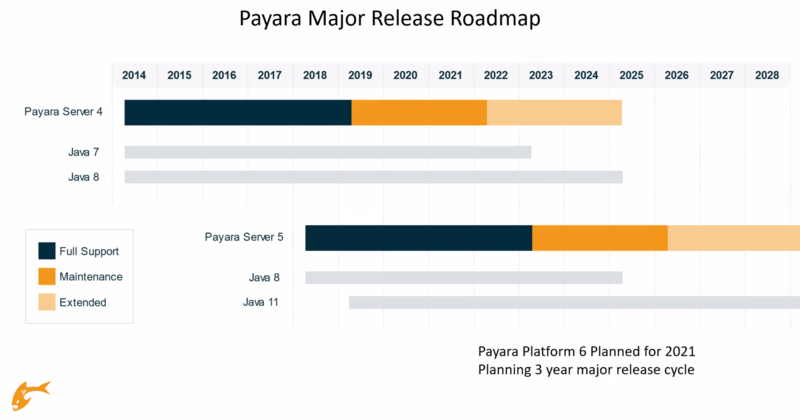 A major release roadmap, shown below, also includes a maintenance plan for Payara 4 and a plan to introduce Payara 6 in 2021. Launched in 2014, Payara was based on the open-source edition of GlassFish 4.1 while being maintained by Oracle at the time. Payara has strived to provide outstanding customer support by being open-source, small/simple/powerful and compatible with major cloud platforms. That's undecided at the moment. Obviously, we are members of Jakarta EE and part of the EE4J project. We will be doing some work on GlassFish to get it through to be Jakarta EE 8 certified. After that, it depends on who is supporting GlassFish in the Eclipse Foundation. Our primary goal is Payara itself. We haven't fed all the bug fixes in Payara into GlassFish. We are quite different from GlassFish nowadays from our source code tree because we have been split off for about four years. If major bugs go into the GlassFish source, we tend to incorporate them into Payara. But after GlassFish 5.2, we will still be around and we will still be working in the Eclipse Foundation on lots of the major components that are in GlassFish, for example, Grizzly, HK2, JPA, EclipseLink, Yasson. A lot of the implementations of the specifications in Eclipse and we will be developing them there. What happens to our involvement of GlassFish core server itself will depend on the involvement of others. One of the first things we're going to do is to adopt the newly re-released Jakarta versions of many of the Java EE and GlassFish components into Payara. For some components, such as the JASPIC and JTA APIs, this will be relatively straightforward. For others, such as Mojarra, we'd first need to re-align our patched version with the upstream Jakarta version. We'd expect, without guarantees of course, to have a bunch of this work done for the coming Payara 5.191 release. Released on March 6, Payara 5.191 includes new features such as: return of the help documentation; remotely invoke EJBs through a JAX-RS endpoint; support for MicroProfile 2.1; and a new command line parameter, contextroot, to define a context root while deploying a Payara Micro application. Due to Oracle licensing restrictions, it was necessary for Payara to remove the help documentation before Oracle donated GlassFish to the Eclipse Foundation. With the recent GA release GlassFish 5.1, these restrictions were lifted and Payara was able to include the help documentation in version 5.191. Payara Platform 6, scheduled for release in 2021, will include features such as: source code will be stripped down and built back up; fully Jakarta EE 9 certified; JDK 11+ based, that is completely compiled and built on JDK11; a new admin console plus a monitoring console; and native Spring support. Payara Platform 4 will go into maintenance mode which will include JDK 8 support until 2024 through Azul and monthly stability releases.